Ocean Breeze West, directly on the gulf, is perfect for those who enjoy small complexes. The building has 47 units with a Gulf front swimming pool and a large sun deck. Enjoy 600 ft of vacant beachfront to the east and 200 feet to the west. For those who expect only the best, Ocean Breeze West 604 is included in our outstanding vacation properties guaranteed to please the most discerning guest. The owners completely remodeled in August, 2016 with new ceilings, floors, granite countertops, new furniture, mattresses, bedding, decor and electronics. The floor plan has 980 SF of living area and large Gulf Front balcony access from the Living Room and Master Bedrooms. Electronics include 46" TV, DVD and Blue Ray Player with extensive cable package in Living Room. Both Bedrooms have 40 in flat screens with DVD players. The new owners, John and Lucy, chose Ocean Breeze West as their second home because the complex is small and the beach is uncrowded. 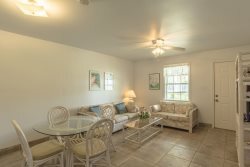 They have worked very hard to make their beach home comfortable, inviting and top-of-the-line and are most anxious to share it with their guests. This newly renovated condo was sooo beautiful. It had everything even night lites (I usually bring my own) Decor - exceptional All tvs worked, blue ray worked Fabo! Friendly and very helpful with any issue that arises. The staff was very friendly, courteous and when I met them in person they looked happy and genuinely glad to meet their renters. Great stay for a great price. I think we got an above average accommodation for a below average price. Lovely Condo! It had everything and we had a wonderful time in Perdido Key. The apartment was as described and very clean. The instructions for the key transfer were received the day before via email. We felt very comfortable in the apartment. The view (sunrise) is fantastic! The beach is very clean and natural. Excellent from making the reservation to checking out. Very helpful, courteous staff. The property was tastefully decorated with colors inviting you to relax and enjoy your stay.